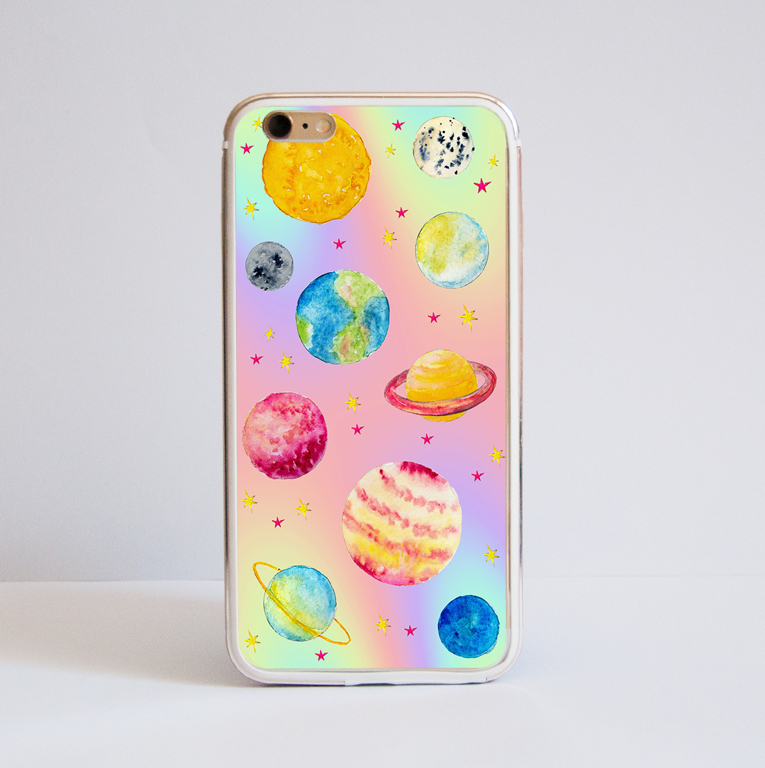 We are excited to present to you our 'Magical Cosmos' Phone Case. Inspired by the magic of our Cosmos we created this design, which features the planets from the Solar System watercoloured and arranged over a holographic-like background. We use our phones all the time, so why not have them protected in a stylish way? The pictures above are examples of an iPhone 6 case. However, we do offer a wide range of Samsung and Google models too, just choose yours from the list of options. The slimline case is made from a light trasnsparent plastic that provides protection without the bulk. The final design is printed directly on the case, using UV inks, which ensures its durability. The sides are transparent. Please note that on the more curved models there can be a slight fading towards the edges, due to the printing process. Each case may have slight variations in print as all cases are different sizes and shapes. Also please be aware that different phone models require different holes in their cases for sockets and the camera lens, which can obscure parts of the design. We created this colourful design, inspired by the magical cosmos. It is hand illustrated, using watercolours, to achieve the colour blending of the planets ans the stars. This case design is a great way to add some magic to your phone. The example images above are of cases for iPhone 7 Plus Case. - Includes PayPal Payment Protection. Our impact resistant cases are beautiful AND strong. 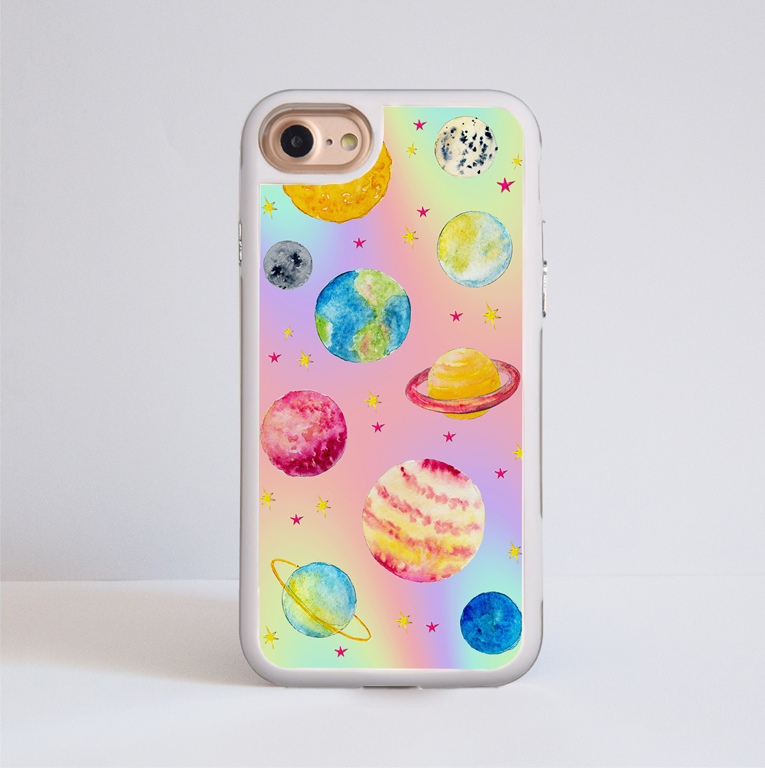 We are excited to present to you our 'Magical Cosmos' Phone Case. Inspired by the magic of our Cosmos we created this design, featuring the planets from the Solar System. They are hand illustrated using watercolours and arranged over a holographic-like background. We use our phones all the time so why not protect them in a stylish way?